This was in my inbox today: limited edition European Collection. I hadn't seen any European Collection in Gap recently, and was worried. What will I buy at Gap just because it's "European?" Are these Pierre Hardy? Just say so, Gap. I'm kind of ho-hum on these, although the Mid-Boot ($178) is a good classic, and the heeled desert boot ($138) is weird and intriguing, but looks clunky in the photo. Both have rubber soles, ugh. I know, a desert boot has rubber soles, but they always trip me up. 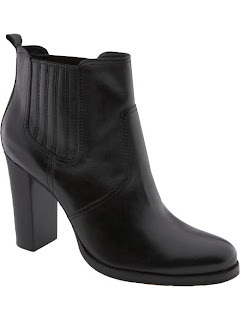 And the black boot, grandma or cute? I might order them all to check out the fit/look, because these boots need to be seen in person (basic cute, or basic dull?). Perhaps Gap was unhappy with all the discounted Pierre Hardy from last season, so now they give us less style and even fewer sizes. The new shoes are available only in 6, 6.5, 7, 8 & 9. 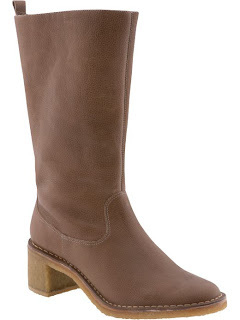 No, the beautiful, fold-over brown bootie with the wooden heel is not for sale at Piperlime. The black, Rachel Zoe pick with no wooden heel is where one is directed instead. No, thanks, Rachel, if just for pure annoyance's sake. Enough. I'm going to go check out some IRL stuff on 34th Street. 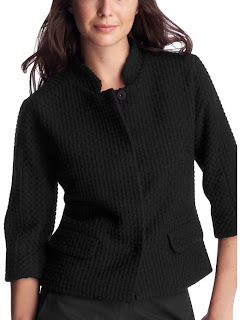 And who knows, perhaps Gap will have some of this in store one day? The black boot is a nice basic. How weird that they're touting this stuff as "online only," spinning it all as if it were better. I do like the brown bootie in the "joy ride" photo, though. I've had many experiences like this: Links in ads that take you to the wrong item. And after much scouring, you discover that your true desire is not available. Possibly never was. DEEPLY annoying. Good luck on your Gap quest. Curious to hear if those boots are sassy or stodgy. Oh Miss Fashion...what a lot of goodies you showed in your post! The absence of things one receives mailings on is really annoying. Very. Have a splendid pre-Fashion Week week! I'm weirdly drawn to that "sand" boot too. How frustrating about the online selection thing...I'm not sure what's been going on lately but it seems I've been having problems across the board with online sales. Hi there-I checked out Gap in store last week, as they aren't online in the UK, but there wasn't too much too inspire me:-} I like the heeled desert boots here though! whaaat? that blue dress is at gap now? must. get. hands. on. it. now! wendy - i think it's a good basic, too, or is it? I want it mano a mano! enc - that brown bootie is hot. and sal - exactly, they should make that damn brown boot! TP - the jacket is you! it looks good when you zoom in on it online, too. always - dying to see it on the foot! sharon - gaps can really vary. 34th Street is huge and has lots to choose. krissy - online only! Run! love your B&H post darliiing! i can't live without B&H, for all my photography stuff! they have it all! love the jewel-colored dress with the dark tights! The teal dress looks fab. And I love the new profile pic!! Oh, the Baltic Blue dress, yes! and the chunky heeled Oxfords, yes!! Love them! i have a man's version of those black boots! wow. i really AM a fashionbeasta! thank gwad this was stinking up my inbox. WTF? 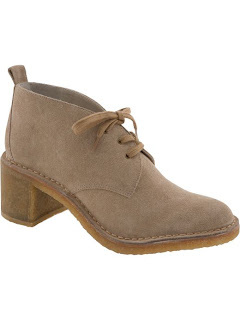 A heeled desert boot. Hmm not too sure how I feel about these to be hoonest. The top boot in the joy ride picture looks pretty cool though! Here La Redoute put somethings "online only", never understood why. gimme an oxford with a heel! GIMME! Alert: Angel on 34th Street! Buy One What This Season?